Ladrón Cellars is an artisanal winery located in Metropolitan Denver Colorado. We specialize in producing premium wines from grapes sourced from amazing vineyards in California’s Central Coast and Western Colorado. We ‘smuggle’ the grapes to our production facility in Englewood Colorado, hence the Spanish world for thief – Ladrón, where they are transformed into our delicious wines. My passion for wine and the winemaking process began during my first trips to California wine country in the 90’s. Since then I have travelled around the world to several new and old world wine regions to experience and learn about the styles and traditions of the local wines. During these travels, and one in particular, I began to create the vision for Ladrón Cellars. It began with the belief of sharing various wine styles and varietals from specific locations in Colorado, California and Washington. We select varietals from these regions that highlight their unique climates, allowing us to produce incredible wines. In order to create amazing wines, the focus is on sourcing from the best vineyards in the selected regions. The California vineyards are located in Santa Barbara County and Paso Robles AVA’s. I mainly source traditional Rhone varietals such as – Syrah, Grenache and Mourvedre. 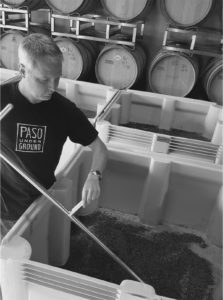 But I have also added Petite Sirah, Zinfandel and Cabernet Sauvignon, which allows me to create concentrated red wine blends with incredible depth. The Colorado vineyards are located in the Grand Valley AVA and Paonia on the western slope. I source several white and red varietals from these regions. The red varietals are focused on Bordeaux grapes such as Cabernet Sauvignon, Petit Verdot and Cabernet Franc, while the white varietals are Viognier, Chardonnay and Riesling. We will continue to select additional varietals and regions, which allow us to create unique red and white blends that increase our palate options for future releases.